There’s not much to say about royal icing, only that you need to mix lots and lots of powdered sugar with a little bit of water and an additional ingredient to give it texture, like egg whites or my favorite product, meringue powder. Since I’m not a big fan of sweets, I don’t usually like to decorate my cookies with royal icing, but I do it every now and then because I know my husband, and especially my niece, really love it. The recipe I’m sharing today is an adaptation of the recipe I found on the Haniela’s website, which is my favorite cookie website. And I say adaptation because I’m not using warm water, I’m also not using cream of tartar since the meringue powder I usually use (Wilton) already has a small amount and because I also add some kind of flavoring to the final product, usually vanilla extract. 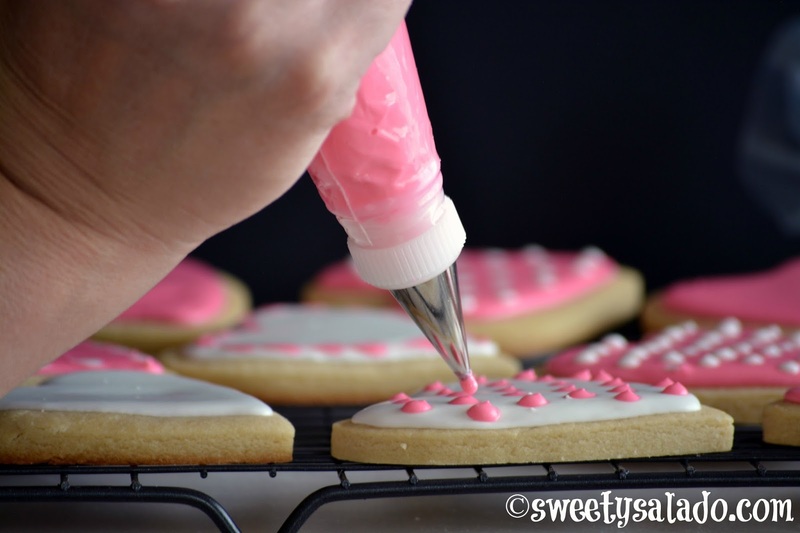 Besides that, it’s the same recipe, even though it’s extremely similar to the other recipes I have used, especially the Wilton royal icing recipe. I personally don’t recommend making it with raw egg whites since using raw eggs can be a big risk to health problems. However, I did leave out instructions below on how to you can make it this way. Since it calls for more water than you would usually need, the texture will be less firm than the usual stiff texture. The reason is because it’s more practical for me to use it that way than to thin out a big glob of stiff royal icing. So, if you want a super stiff royal icing so you can water it down later with a bit of water, I recommend you use less water to mix the meringue powder. You’ll see that it’s a very easy recipe to make and that it has great flavor. Clean your mixing bowl and paddle really well with a paper towel dipped in some vinegar. This will get rid of any grease they may have. Whisk the water and the meringue powder really well until it dissolves and it gets foamy. Add the powdered sugar and mix on low speed for about 10 minutes. Scrape the inside of your bowl to make sure all the sugar is well incorporated. Add the flavoring of your choice and mix again to incorporate it. 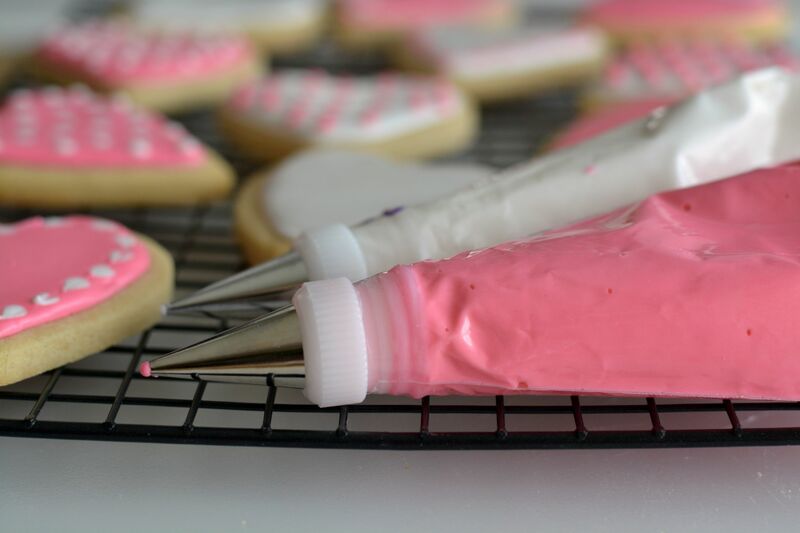 Pour your royal icing into an airtight container, cover it with plastic wrap and then cover it with the lid. It will keep fresh for about 2 weeks at room temperature or up to 1 month if stored in the refrigerator. Before decorating, you can add the color of your choice. Mix it well until you obtain the color that you want. *Use less water when mixing the meringue powder to obtain a thick, firm consistency. *Once made, add a little bit of water (about ½ tsp at a time) to obtain a softer consistency. 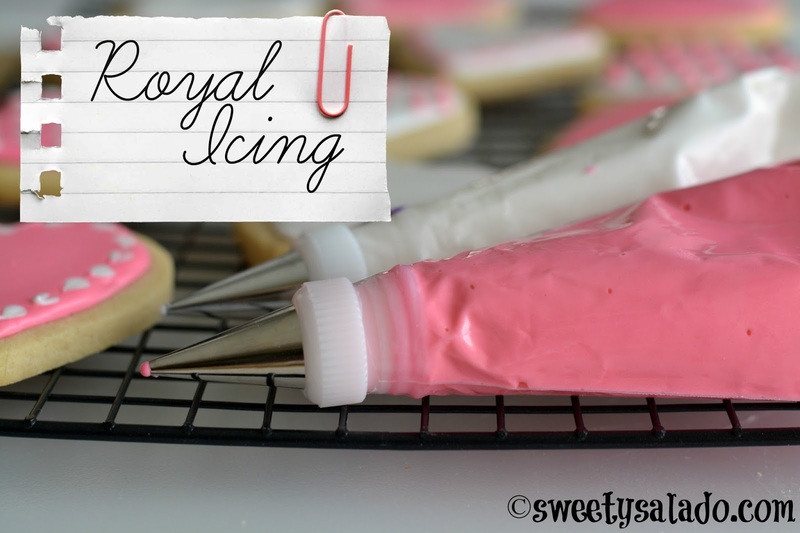 *Once made, add more powdered sugar if you want your royal icing to be firmer. *Medium consistency is when you cut the royal icing with a knife or a toothpick and the traced line disappears after about 20 seconds. *Flooding consistency is when you cut the royal icing with a knife or a toothpick and the traced line disappears after about 10-15 seconds. Hola. El meringue powder Es lo mismo q cream tartar? ¡Hola! No el merengue en polvo está hecho con claras de huevo secas y molidas, cremor tártaro (cream of tartar) y un poco de azúcar.